* Current member site leaders and learners are encouraged to attend this lecture to share your experiences during our Q&A. A complete list of our Foundations @ CORD presentations can be found here. 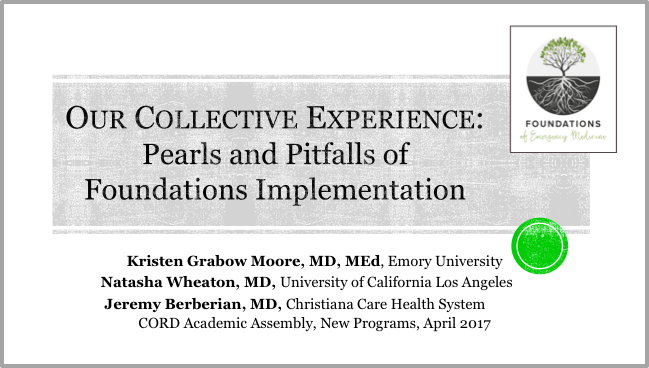 Come join members of Foundations leadership to discuss implementation at your site, ask questions or just meet our team. Keep your eyes peeled for our Foundations Leadership who will be wearing green lanyards at CORD. Please stop us and introduce yourselves! Also, be sure to check out our Office Hours listed above to pick up your own swag and show your Foundations PRIDE at CORD! Follow us on Twitter @FoundationsEM for Foundations updates and CORD happenings!